Our 15 years of Experience in the Shark Cage Diving Industry, using only the Highest Quality Operators with 100% Safety Records and highest customer service rankings, coupled with an incredible Shark Diving and Accommodation Deal means when you book with us, you are Guaranteed to enjoy an Unforgettable experience – For all the Right Reasons! Diving with Great White Sharks takes place in Gansbaai which is on the coast of the Western Cape of South Africa, near to Hermanus. Cape Town to Hermanus is 1.5 hours approx. All Great White Shark diving trips launch from Kleinbaai Harbour, which is a couple of kilometers from Gansbaai – the White Shark capital of the world. The drive from Cape Town to Gansbaai will take you 2.5hrs (165km) or if you are staying in Hermanus, the journey is only 45 minutes by car. 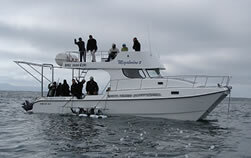 The trip will make its way out to the famous Dyer Islands and Shark Alley. The islands are covered in seals and penguins, the sharks are migratory and will be in this area for food. We do not feed or handle the sharks, to do so would jeopardize the ecology and our permit to run these tours. We are merely observing the Great White Shark in it’s natural environment whilst educating as many people as possible about this incredible predator. If you don’t’ have your own transport, we can easily arrange a transfer for you. 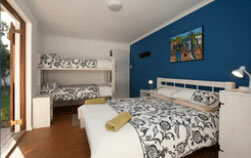 Return from the City of Cape Town, R400 per person. Return from Hermanus, R100 per person. We have 97% sightings, so you’ll more than likely see sharks. 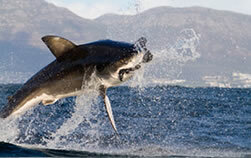 The very best time to see White Sharks in numbers is during the South African winter months (May-August). A few months either side of winter are also excellent times for viewing. During the peak middle of summer (Christmas/New Year) the number of sharks seen is usually less, this is due primarily to the colder water temperatures of mid summer. We do get the very occasional day during peak summer when we might not see a shark, if this happens during your trip, you will receive a voucher to go out again for free.